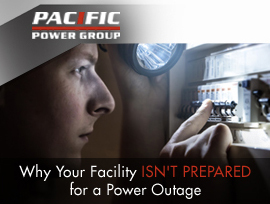 The truth is, not all facilities are properly prepared for an unforeseen power outage. A massive storm, power grid failure or other hazard can have dire effects for facility personnel, building operations and the businesses and communities that your facility serves – sometimes resulting in irreparable damage. However, there are steps that building managers can take to prepare their facility’s power system to prevent loss of power and the threat an outage poses. You may want to consider taking these steps in order to be better equipped for loss of power. Many facility managers make the assumption that just because they have a backup generator that it will provide power when needed or that it will operate indefinitely, which is not always the case. At minimum, it’s key to have enough power to allow staff or tenants to wrap up their tasks and safely shut down computers and servers without the risk of losing data. Depending on your facility and its operations, you may need a backup power generation system that can provide power for much longer. For any situation, you’ll want to choose a trusted generator brand that operates reliably and can help ensure sustained power for your entire facility. Selecting a generator such as one from MTU Onsite Energy, who’s generators are world-renowned for their reliability and ease-of-operation, is an excellent place to begin. One of the most critical features to plan for in your power generation system is multiple levels of redundancy – multiple generators that can handle your facility’s needs in the event of the primary or secondary generators failing to start up during an outage (which can occasionally occur). Even with the best laid plans, it’s critical to be prepared for system failures. If your primary generator fails to start after a power outage, multiple levels of redundancy in your backup generator system can be essential to keep power running. In facilities like office campuses and municipal complexes, a backup power system that is prepared to handle a generator outage can mean the difference between continuing operations and a workplace fiasco or emergency by allowing important services such as lights, internet and elevators to continue working. When planning your power system, make sure to look for a vendor partner that has experience engineering redundant backup power systems. Maintenance is an essential factor when implementing your facility backup power plan. While you may not use your backup power system every day, that doesn’t mean regular maintenance can be forgotten. In order to keep your power system primed and ready for a power outage, a regular preventative maintenance plan is needed. A skilled service provider can craft a preventative maintenance plan that is customized to your power system and take into account environmental concerns such as increased humidity or colder temperatures depending on where in the country your facility is located. Will you need fluid sampling and analysis? Fluid sampling and lab analysis of lube oil, coolant and fuel can be added to your generator maintenance program to better monitor the condition of your generator’s vital fluids, ensure reliability and identify trends and anomalies. Early detection of anomalies in the engine’s fluids can often allow minor issues to be corrected before becoming a costly major failure. How often will you need load banking services? Light loading is common with many diesel generators operating in today’s facilities, and this can cause incomplete combustion, excessive smoke and dilution of oil. Regular load bank testing can help prevent this from occurring. In many applications load bank testing is also a legally required component of a generator maintenance program. Will you need fuel polishing service? This is a service that removes water, microorganisms and sediment from your fuel. Not all service providers have fuel polishing capabilities, and if you have multiple large fuel tanks this may be a more cost-effective service than fuel replacement. Some service providers can offer digital tracking tools to streamline your maintenance program, such as Pacific Power Group’s PM Tracker, which schedules and tracks maintenance on each individual piece of equipment in your power system in real time. Partnering with a service provider with an excellent service record, Electrical Generating Systems Association (EGSA) certified service technicians and 24/7 support should also be primary considerations when choosing a partner for service. Once you have established your backup power system and defined your preventative maintenance needs, you’ll need to establish best practices in case of an outage. Identify tasks that are critical for your facility during an outage and assign different team members to specific tasks. This is critical to ensure that everyone knows what to do prior to an outage. Tasks to consider include coordinating with your power company, communications with your generator maintenance team, and communicating updates to your staff and/or facility tenants. You will also want to assign one person to be the point of contact for emergency services, and to be the point person during an emergency event. These tasks may be closely tied to your Emergency Response Plan. Ensuring the safety of your facility and the ability for facility staff to continue their work can be critical during a loss of power. Following these steps can help your facility be better prepared for a power outage.